Recommended Practices for the Retail Electric and Gas Industries. Extreme weather events in recent years such as the Polar Vortex of 2014, and the more recent “bomb cyclone” and “artic outbreak” of January 2018, have highlighted the continuing challenges faced by participants in both power and gas retail markets. More such challenges are sure to come. Consequently, members of the CCRO have pointed out that there is a real need for authoritative and independently developed standards for risk management practices at retail energy providers (REPs). All retail market participants will benefit, including REPs, their suppliers, their credit support providers, regulators, and system operators. Much like the wholesale standards published by the CCRO, these retail standards will help to advance risk management by providing participants a baseline of practices against which a specific REPs practices may be objectively benchmarked. These new REP practices will build upon the rich foundation of risk management recommendations that have been published by the CCRO over the last decade. This initiative will serve more than just REP companies. The retail segment is very dynamic and we continue to see new REPs entering the market. This creates unique opportunities and challenges for market participants supplying, credit supporting, and regulating these REPs. This CCRO effort strives to provide a roadmap for all REPs to follow in order to distinguish themselves by demonstrating leading practices through use of these standards. Larger energy companies with affiliated retail businesses will benefit by the integration of leading retail practices within those of a larger more diversified energy business. 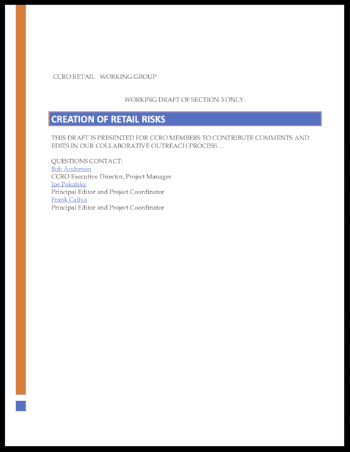 After reaching an ideal overall structure for this comprehensive series of papers, and completing fifteen webinars with interested CCRO members, the retail risk management group has been aggressively developing the section addressing the "Creation of Retail Risks", for power and gas retailers. This section provides an organized taxonomy of all risk types that retailers face, and a thorough discussion of them. The risk framework provided here establishes the foundation for subsequent sections and recommendations to come.